Special collaboration: WSP Canada Inc. 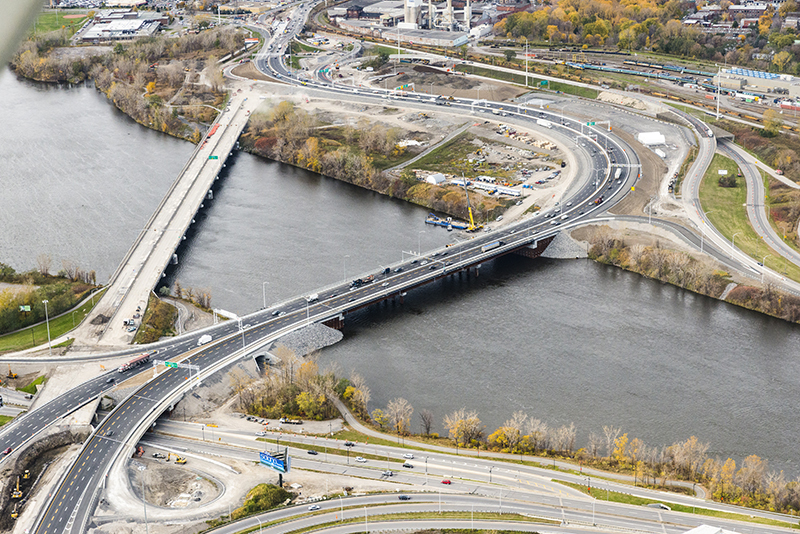 This temporary bypass bridge was fabricated by Canam-Bridges as part of the project to replace the Île-des-Sœurs bridge, which serves as the gateway to the new Champlain Bridge. This bypass bridge is a 541 foot (165 meters) long causeway. The structure was built to limit the impact on traffic during the reconstruction of the permanent Île-des-Sœurs bridge, which will be on the same axis as the old bridge. The project involves 2,300 tons of steel components. The bridge was opened to traffic in December 2014. The existing Île-des-Sœurs bridge, which was commissioned in the early 60s and connects the Island of Montreal to Île-des-Sœurs, is located on the same axis as the Champlain Bridge, a road section that ranks among the busiest in Canada. The bridge had reached the end of its useful life, necessitating major repair and maintenance work each year. 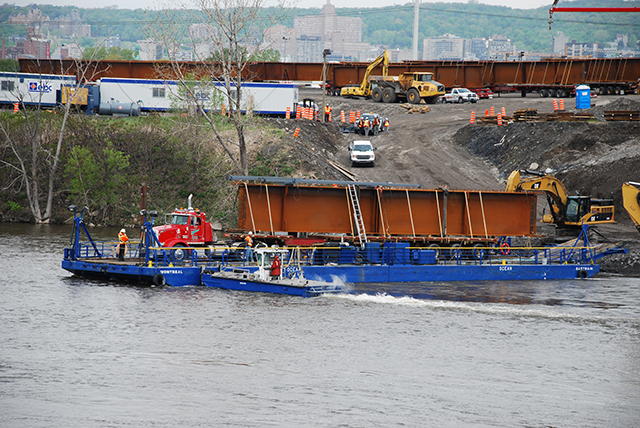 The project involved the construction of a temporary bridge between the Island of Montreal and Île-des-Sœurs, which included a variety of interesting challenges. For one, the schedule was very tight. In addition, one goal of the project was to limit the structure’s encroachment into the river to respect its hydraulic capacity and environmental limits. The fact that the bridge was designed to have a limited lifespan also guided the choice of materials. Steel proved an ideal solution to meet the project’s various challenges. It made it possible to prefabricate girders at the plant, use long spans and limit the environmental impact when the bridge was dismantled. Considering the project’s tight construction schedule (16 months), the use of prefabricated steel girders proved to be the perfect choice. The 9-foot (2.7 meters) high girders were delivered by truck to the work site and assembled using cranes and barges. Photo: Hélène Tremblay, WSP Canada Inc. Integrating the environmental aspect into the bridge infrastructure design was a major issue. One of the challenges was to limit the causeway’s area of encroachment while optimizing the bridge’s design. Using steel girders to build the temporary causeway allowed longer spans to be used, reducing river encroachment (fewer piers in the river) and thereby respecting the river’s hydraulic capacity and environmental limits. The target lifespan for the temporary causeway is 20 years. The use of steel girders in its construction was a sensible and ecological choice, since they are recoverable, reusable and recyclable. 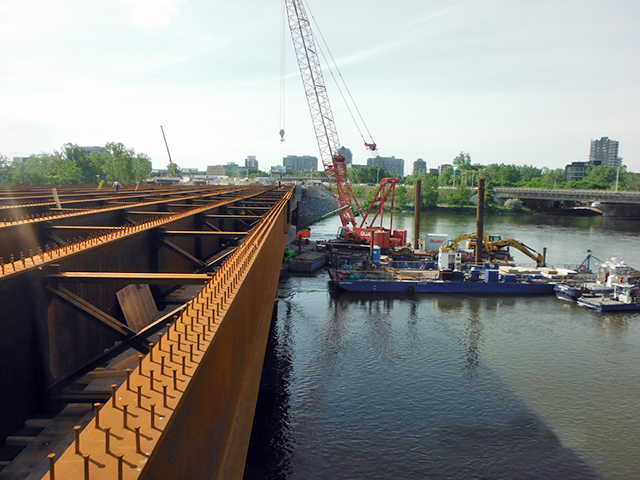 Canam-Bridges’ task was to fabricate and deliver 50 I-girders on an extremely tight schedule. This lot included 30 girders measuring 131 feet (40 meters) in length and 20 girders measuring 76 feet (23 meters) in length. The main challenge was to mobilize the plant in such a way that the proper level of production could be maintained. 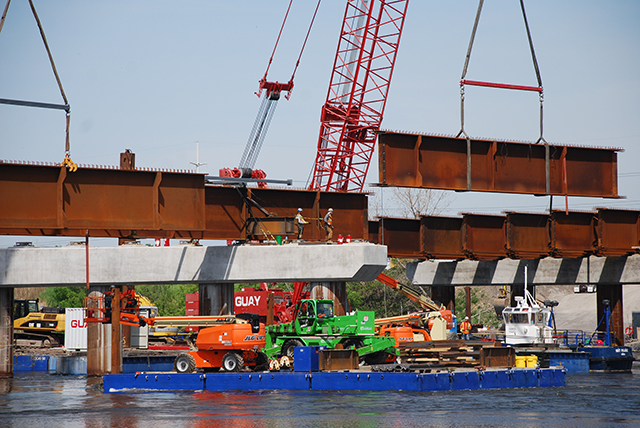 To achieve this, Canam-Bridges conducted girder-by-girder, hour-by-hour and station-by-station monitoring. As for shipping, the task was to deliver six to eight girders a day in the heart of downtown Montreal. This involved restrictions such as night delivery, limits on hours allowed for transportation, various active construction sites, limited access to enter the site and limited storage space. The steel erector made a point of highlighting the fabrication quality of the girders and secondary elements. No manufacturing defects were identified during the erection process, which let them assemble the girders without difficulty and follow their very tight erection schedule. Engineering firm: WSP Canada Inc.